Welcome to Woof Wednesday. Please meet some special dogs from CA, FL, GA, IN, NY, PA and TX all in need of good, loving homes. Roxxie is a 10 month old westie mix. She weighs approx 15 lbs. She is very much a puppy with regards to her energy and behaviors. She gets along with other dogs and all people. She has a beautiful soft white coat. She will need training, direction, and routine as all puppies do, but she is bound to be the perfect companion for one lucky family. More information on how to her is available at this rescue's website which is listed below. Let's find this cutie a great home! Dogs & Puppies at the Moreno Valley Animal Services facility are in desperate need of adoption. They are not receiving enough adopters, thus after a short 10-14 days after they arrive at the shelter, they have not choice but to euthanize for cage space. This dog needs you to save them. Please spread the word to your friends, family & local rescues to turn the urgent situation at Moreno Valley around. Let's find a good home for this special dog! This pet is located at the Moreno Valley Animal Shelter and urgently needs to be adopted or rescued. For more information about this dog, call the shelter at (951) 413-3790, as our group's email link in the posting does not reach the shelter. If you are in the north San Diego County area and would like to become an approved foster home, please inquire. To rescue dogs from shelters such as this shelter, we need foster homes. Contact us for more info via email link. Meet the dynamic duo of Buttons and Bouncer, 7 year old Poodle brothers. These happy little fellas are ready and eager to find a forever home to call their own. Buttons, at 15 pounds, is relaxed and easy going. He is happy to be held and petted, or is just as happy to hang out with his best pal Bouncer. Bouncer, the big brother at 21 pounds, is the leader of the pair, always watching out for his little brother, but even more likely keeping an eye out for what his favorite person is up to. These two sweet boys really enjoy their daily walks. When they see the leashes come out, they are ready to go. They also enjoy car rides and will sit nicely on the back seat watching as the scenery passes by. And by the way, these pups want everyone to know that they are a bonded pair so when you adopt them together, they promise to double your love. Please lets find these brothers a great home! Sprout is a small little fella weighing in around 8 pounds. A Yorkshire/ Terrier Mix. He is very sweet, does not bark much, likes playing with the cat, my children, and our puppies. He jumps up in my lap when I sit down and follows me around like a lost puppy. He is up to date on shots, neutered and negative for heartworms. Please lets find this precious little guy a home! 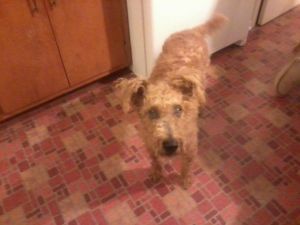 Teddy is Scottish Terrier Mix who is very sweet and a smart dog. He is however 90% blind and suffers from seizures that are controlled with a very inexpensive medicine. He needs a special home to love him. Please lets find him a special home! 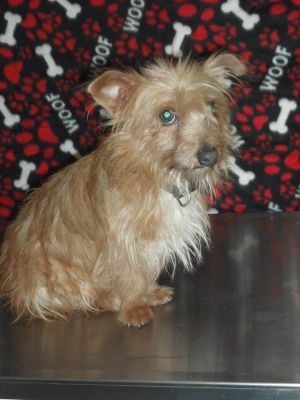 Liesel is a cute wire-haired dachshund mix with red hair and a delightful personality. She's used to living with other dogs and gets along well with them. She likes to be with people and is both playful and affectionate. Liesel weighs about 21 pounds. Lets find her a great home! the sweetest dog and loves other dogs. He is very gentle and kind, will be good in any home as he is also good with children. He enjoys walks, playtime but is just as laid back in home and well behaved. He is even housebroken. Let's find him a good home! Henry is a super sweet American Bulldog, he's about 1-2 years old. He originally showed up at ACCT in Philly. He is in foster care and a great guy don't let my cropped ears fool you, I'm a big mush ball! 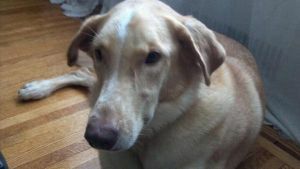 I like the other dogs in my foster home, I love my foster mom and everyone I meet, I'm super sweet and snugly! Sometimes I don't realize that I shouldn't be a 70lb lap dog, but hopefully my new family won't mind. Let's find this sweet guy a loving home! Samson is about 6 years old. He was brought to 2nd Chance after having been rescued from a local animal control facility. He is fully vetted and is ready to find a loving family to call his own. He would make a wonderful pet and companion to the lucky person or family who adopts him. He is a great dog. Let's find him a great home!